Discussion in 'Patriots Draft Talk' started by manxman2601, Aug 22, 2018. Interesting to talk team needs before and after the season. Before I can talk about needs I need to mention who I think walks or should be asked to so we save cap space. I think Gronk Allen and Brown are all gone. They can resign Hogan, Dorsett, Paterson, Gost/Allen and Brown for fairly cheap. I think they 100% have to resign flowers. They can't lose him. I think they keep the McCourty bros here but Devin needs to take less and will. Other odds and ends like J. Jones they will keep for little cap hit. My top needs are as follows right now. 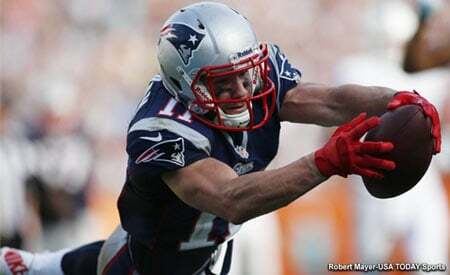 #1 TE - It is very possible Gronk retires and I don't want to keep over paying Allen. This is a spot I look to go for in the top 2 rounds. They need an impact player here. #2 DL - They need a running mate for Flowers. The DL just lacks talent on the whole. They can continue to coach and scheme around it but talent would make it easier. #3 S - They need to start thinking of getting someone in here for Devin/Chung. I don't like how old our safeties are. This becomes less of a need if McCourty is resigned for a cheaper deal. Right now I'll hedge it. #4 QB - This can be the biggest need or the least important one. If a guy you like falls to you take him, but don't reach. We have gone too long without a good draft in the top end and need to start getting more young cheap stars in here that can help now. #5 LB - Hightower isn't going anywhere next year but they will need to make a decision on him soon. They can stay pat at LB again and hope Bentley can come back into form and be the player we want. It isn't likely a young kid forces Hightower off the field in the next few years even if he is getting slower. He still knows the defense too well and doesn't blow assignments. That is worth something. #6 WR - Edelman is the star here but I don't think the cast of Hogan/Dorsett/Patterson are enough. Edelman is only getting older. They will also need an OT but they need a vet not a rookie. As for RB I think they will be fine. At CB I'm okay going with this group again but again if a guy falls to us take him. I remember a time when we had three 1st Round draft picks in the d line and a second rounder on the bench. Wonder if B.B. remembers those days? Yeah but what did that team do? Ok, here is the latest depth chart (Free Agents were removed). WR & DT remain at the top of the list. All other positions could use depth but those three stick out to me. Opps! Sorry, looks like some more work to do, I will make some updates later in the week. Thuney and Andrews are WAY MORE than adequate. My biggest needs are as follows. 1. TE - Even if Gronk comes back for another year. Save 7m by cutting Allen which can be used to be the cap hit on a 1st year deal to extend Trent Brown. someone like Sanu. And, a speedy one to stretch the field. 3. DT Gotta replace Shelton/Brown. Draft is loaded with DT's. 4. DE - Never have enough pass rushers. 5. S - Getting long in tooth here. 6. QB - I'd wait til TB12 can't play.. I'd love to trade for a couple of Vets like Sanu or sign G. McCoy if TB cuts him. Then fill out the rest in the draft. Gotta keep Flowers and Brown. I like the way you think, but Allen has had a big part in our success running the ball. I'm not sure that I want to get rid of him. If Gronk does retire, then we need some continuity. TE for sure. Still want Allen back. Don’t want to take a TE in the first unless he is truly worthy. Hate drafting off of need. DT’s galore. Identify the best one and do it. I love White and wouldn’t blink to trade up if he slides a little. The DT depth chart looks a little thin with guy and butler. I am thinking bb signs a free agent we’ve never heard of and drafts one in the first or second round. The wr depth chart is almost empty. Running option routes and gaining brady’s Trust is hard. I think bb signs two free agents and drafts two in the middle rounds. The running back depth chart is one Michel injury from being very skimpy. Bb will draft a running back. Tight end is up in the air. However, we need to draft the kid from Texas [email protected] He is perfect for our offense. I also like the kid from LSU. He is a replacement for allen. We also need a kicker, punter and two special teamers. Why would we take a punter?? TE - this class is incredibly deep and has an abundance of talent as well. LB - Devin White is the top guy in this years draft. He’s nfl ready. There’s also some nice late 1st round guys and then solid 2-4 round guys too. From a free agency side - we have around 18m in cap. If Gronk, Allen and Clayborn are gone that’s about 20m of cap space freed up without redoing any contracts. There’s defiantly opportunity to bring in some guys but depends on how we go about it. Brady will have his contract extended so that will lower his cap hit as well. We should be able to keep Flowers I feel if we do certain moves. Quietly confident on this off season. Free agency looks bare so I'd focus on trying to re-sign Flowers and then some depth pieces if the money is sensible: Brown, Jones, Dorsett, Gostkowski, Allen, Hill. I'd try and pick up some WR competition in free agency like Jamison Crowder or Adam Humphries. Have to try and restructure a few contracts if possible, or there could be a couple of big name cuts. I would assume Allen and Clayborn are gone unless they cut their salaries. With the draft I'd focus on DT, S, WR and TE as key priorities. And I'd try and pick up a developmental OT in the middle rounds. However, if the right QB is there I'd draft one early. Ryan Allen's contract is expired but I imagine they will just go for an undrafted guy or they resign him. Same goes for the Ghost- I think BB is starting to doubt him though, if you go by the Mic'ed up in the super bowl. What did Bill say about him? I thought it was pretty standard -- he just asked Judge (ST coach) if Gostkowski was good from that distance (40+ kick). It was a single, offhanded remark, but some have interpreted it as a lack of confidence in Gostkowski. I'm more of the opinion that he was just making a procedural check before authorizing the FG. Yeah I just saw that segment last night on either Turning Point or Mic'ed Up or something, and it doesn't sound like a real big deal either.